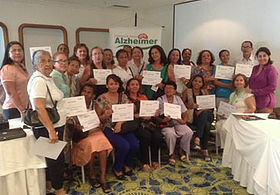 The Alzheimer's Foundation in Cali has developed community services that educate, prevent and sensitize the community about the disease. 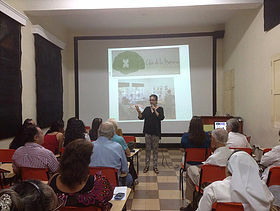 Its influence in the Colombian society has increased over the years thanks to their intervention in the educative processes, the national and international scientific community, and the improvement in the treatment and care of people affected by the disease. This is the social approach of The Foundation. It is a talk that offers and initial guidance about the disease and how to handle it. It is thought for the entire community: caretakers, families, and healthcare professionals. 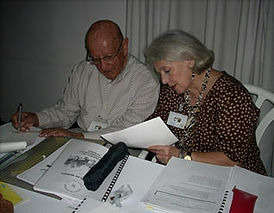 Its main goal is to promote an active aging, and proper care of mental faculties related to a good memory functioning. It is ideal to any person interested in learning techniques and strategies to stimulate their mental faculties for a better memory. It is a service in which professionals and therapists go to the patients home. There, they can assess and plan the therapeutic activities that best fit the patient in their home with their family, with the purpose of maintaining their autonomy and functionality. The Foundation, with its therapeutic intervention method, has become an attention and research leader in the community. High-school, undergraduate and post graduated students perform their educational practices according to the several areas of interest. The Foundation periodically organizes activities to be at the forefront with the latest news and developments about the disease and its handling. Scientific Meetings are institutionalized events, and several national and international professionals assist.